Super Metroid is the third entry in the series, and considered by many to be the pinnacle. 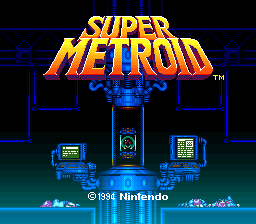 The game features impressive 16-bit graphics, a moody soundtrack perfect for the isolated feeling of Planet Zebes, and plenty of hours of gameplay to be found as you explored deeper and deeper into the planet, unlocking the mysteries within as you search for the Last Metroid and Mother Brain. Discuss the off states of Wrecked Ship rooms not accessible while the Wrecked Ship is off; there's also a test version of the item collection theme in the SPC set. Holding Select + L and pressing X will open a sprite tile viewer. Continue holding Select + L and press A to view the tiles with different palettes, or press X again to view the second set of sprite tiles. Hold Select + L and press A for a (buggy) palette viewer. Hold Select + R and press A to turn off the Layer 3 stuff (status bar, liquids/fogs). Hold Select + R and press B to set Missiles, Super Missiles, and Power Bombs to 0. Select + L + Y grays the bottom portion of the screen (possible CPU usage meter?). Start - Save prompt. Save and reset, or (likely) crash. Your choice. Select - Displays the room's enemy set data (needs the debugger font). A - Toggle Samus <-> enemy interaction (you can't hurt each other). L - Disable framely processing of enemies (all enemies stop). R - Enemy Mover (and what loads the enemy debugger font). The enemy mover is what's important, here. It shows you the enemy's name, X/Y position, current HP, the enemy set name, and lets you move enemies around with the pad on controller 2. Press Select to select the next enemy, B + Select to go back one (somewhat buggy). Pressing A will summon the enemy to a spot on Samus' right, and holding X while moving the enemy around will move it much faster. Pressing R will bring you to the enemy room population entry editor. This edits the enemy's entry in the room population data in RAM. Use the pad to move the cursor, X to increase the value, and B to decrease it. Select will move the enemy to the X/Y pos that you've set while A does the opposite, setting the X/Y pos to the enemy's current position. Pressing R will exit, but pressing L goes to the enemy spawner. It gives you a list of enemies in the current enemy set. Choose an enemy with Down, spawn it with L, and cancel with R.
This will make the R button in the enemy spawner take you to the extended enemy debugger, rather than exit. Here, you can view all kinds of enemy animation and AI variables. Press R to move to the next page. After a few pages of four variables per page, you'll be dumped into the enemy set display where you can press Select to exit the debugger. 808000FF - Bypass country and NTSC/PAL check. 808002FF - Enable what is most likely the demo recorder. It tries to record what appears to be the current button presses, button holds, Samus' X/Y position, and the X/Y position of the top-left corner of the visible area. Unfortunately, it does nothing, due to the fact that it tries to write these values to ROM (which would have worked fine on Nintendo's development systems, but not on the SNES alone). 808006FF - Lets X on Controller 2 toggle scrolling on and off. Pretty annoying. You have to use this with the main debug code (which enables reading of the second controller) in order for this to work. 808008FF - Possibly something used for audio debugging. Start up with this code and you'll crash when you go through a door. Turn the code on during gameplay and the music won't change, with a few rare exceptions. A2AAF000 - Hold B on Controller 2 to make Samus' ship lift off when you enter it. 84B33360 - Display scrolling trigger extensions. 84B36660 - Display scrolling triggers. This strange little hidden code somehow remained undiscovered until late 2010. Open the door to Golden Torizo's boss fight room (he should still be alive), then hold A + B + X + Y and enter. Keep these buttons held until the room finishes loading. There is a catch, however: once you let go of the fire button, the game will freeze due to two of the beams being incompatible, but being forcibly enabled by the code. As such, you can enter this room while in Morph Ball mode to avoid freezing the game or just be lucky on how you let go of the fire button. This will reset your inventory to 700 Energy, 300 Reserve Energy, 100 Missiles, 20 Super Missiles, 20 Power Bombs, all beams equipped (remember to disable at least one of the bottom two), and all items except Screw Attack. 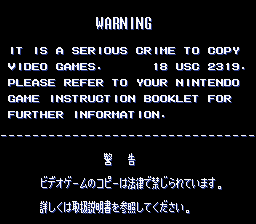 There are two anti-piracy tests that are performed on boot/reset. The first is the region check, the second is the SRAM mapping check. The region check tests whether the region reported by the game header ($00:FFD9) is the same as the region reported by the SNES PPU ($213F). Unlike the SRAM mapping check, this check does not delete the SRAM on failure. The SRAM mapping check first copies the 8KiB SRAM at $700000 copied to WRAM for backup. Then this SRAM area is erased. An incrementing series of values ($0000, $0001, $0002,... $0FFF) is written to the $702000..3FFF area, which on the real cart is a mirror of the 8KiB of SRAM. Finally, it reads back the 8KiB of SRAM from $700000 and asserts that the incrementing values have been written. If they match, the program restores the WRAM backup to SRAM and continues to boot as usual. On extension devices or copy devices/cartridges there may be more SRAM and the two 8KiB areas not mirrored. In this case, the above assertion fails and the anti-piracy message is triggered, leaving the SRAM erased as a result. Use the code 8086C201 before the game starts up to see this message from Nintendo. This can sometimes appear without an Action Replay on a real cartridge, likely due to connection problems between the cartridge and the SNES. It is not known whether this line can be displayed in-game. It seems to simply be something added by a programmer as gratitude toward the debug team. Get high quality videos of all these. 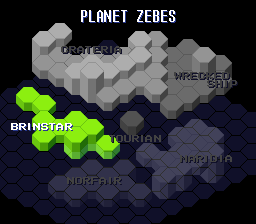 There are a few unused sprites in the game, all in working, or mostly-working states. With a little configuration using SMILE, you can add them to a Super Metroid hack with ease. Bang is one of the strangest enemies in the game, and likely unused due to how potentially deadly it is. With effort, one can get a Bang working in a room. Bang will float around the room until attacked, at which point it will flash and grow larger. After a certain number of hits, Bang will explode, killing itself – but at the same time, unleashing all of the damage that you have given it back at you. At later areas of the game where your beam is quite deadly, getting hit by the backlash from a Bang can be near-fatal. Luckily, Bang's explosive burst does not track you, and usually a simple Morph Ball evasion is enough to avoid getting hit. Reflec is an enemy sprite that has the ability to reflect your shots back at you, or if positioned at an angle, can be used to angle shots. Its usage was first widely realized in the hack Super Metroid Redesign, in a room where the player had to reflect a missile through a series of Reflecs to extend a bridge. Shots reflected by a Reflec can damage the player. Reflec is fully programmed, and can be set to appear in eight different orientations, one for each cardinal and intermediate compass direction. Considering what a strange enemy Reflec is, it's not hard to guess why it wasn't used. There's no real situation in the game where it would have been useful, though as a puzzle element it could have been well-implemented. In-game, it is loaded in RAM in two areas: the vertical chasm in Lower Norfair before the series of rooms leading to Ridley and the Energy Tank room after Kraid. Stoke looks to be a miniature Crocomire, which has led to some calling it a baby Crocomire. Stoke is a mostly finished sprite; it has basic movement and collision detection, but doesn't always function properly. It uses a palette unlike Crocomire's, despite having a distinctly similar appearance. With a bit of effort, one can restore this red palette. In-game, Stokes are loaded in the Crateria room with a small Morph Ball tunnel that requires the Morph Ball Bombs and leads to a Missile Pack. They do not use the correct palette in this room, oddly. It's unknown why Stoke wasn't finished. Perhaps they simply couldn't think of a reason or place to use one? 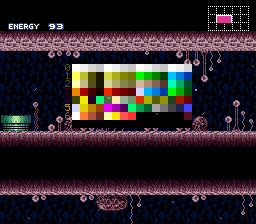 An unused palette set with the same tiles as normal Crateria, but features a rather bright red palette instead. It looks as though it may have been intended at one time to be a palette for the escape sequence, but considering that the escape only has the player outdoors in one room (the landing site), it was probably deemed unnecessary. Another reason may have been that during the escape, palette effects are overlaid on the normal Crateria set, giving an effect similar to Red Crateria but with a more urgent feel. In fact, trying to use Red Crateria in conjunction with the palette effects will force Crateria to use the normal palette, as the effects appear to be hardcoded to that palette. The red Brinstar tilesets include the tiles used in Brinstar and Kraid's hideout. The tileset is later (or earlier, depending on how you look at it) used before the statue room at the entrance to Tourian. Unlike Kraid's region, however, it uses another palette set and is blue. In this set, there is a palette for the red Brinstar tiles as well, giving them a black and yellow appearance. Black Brinstar is not used anywhere in-game, though some theorize that it was planned to be used in the room before the X-Ray Visor, as it uses the fireflies that make the room darker when shot. A cluster of Half-Ripper tiles shown in SMILE. There's one unused tiletype in the game. It doesn't truly have a name, and to call it what it does would result in more of a long description than a name. Instead, the name is derived from the image that SMILE uses to designate the tiletype in usage: a 16×16 picture of half a Ripper enemy overlaid against a black rectangle. The Half-Ripper tiletype is unique in that it does not allow enemies or shots to penetrate it. Only Samus may pass through the tiles. This means that the tiletype is especially good for hiding secret passageways in rooms with wall-crawling enemies such as Zoomers, Zeelas, or Novas. Wave Beam shots will still pass through the Half-Ripper tiletype. The tiletype is not revealed when using the X-Ray Visor. It's unknown why the Half-Ripper tiletype was not used in the game, as the coding behind it is totally complete. Perhaps it was decided to be too cheap a tactic for hiding items, as the only way to discover a passage concealed by the tiles is to physically run into it (shots and the X-Ray Visor won't uncover anything, either). 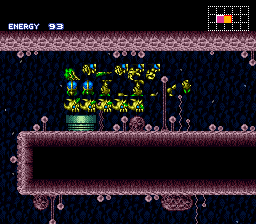 The Crateria tileset comes packed with several unused tiles that could fit in with the other bridge tiles outside the Wrecked Ship; the palette used for those tiles even matches the unused ones. Also in Crateria's tileset are copies of certain background tiles, although unlike the originals they feature the letter "P" drawn over them. While the tiles are unused in the game itself, they are used in the tile table. This suggests that they were used for testing, only to be replaced before release. From the menu graphics. 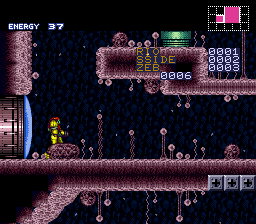 Long Beam is the only upgrade from the first Metroid to not return in Super Metroid, as Samus starts the game with it. 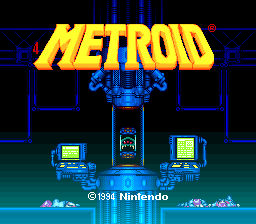 An early title screen, simply saying "4 METROID" (though the "4" may just be an error). This may have been a placeholder during development. A small one-screen room in lower Norfair that uses the Lower Norfair tileset. It looks as though it would likely have been part of a bigger room, considering it seems to be the top of a vertical shaft. Some claim that this room was originally the start of the room with the rising acid, but that room is located 104 bytes away, making room for four rooms between this one and the one with the rising acid. Another thing to note is that the room either lacks door data leading out, or it's simply corrupted. A large 6×2 screen room that was likely used by developers to test the various game tiletype and BTS interactions. Normally inaccessible, SMILE can be used to set up doors to connect to the room, or in newer SMILE versions use the test room feature to spawn Samus directly into the room. Its Room ID in SMILE is 7E82C. The upper left and middle have testing grounds for non-respawning and respawning 1×1, 1×2, 2×1, and 2×2 Crumble and Bomb blocks. Further down, the missile graphics are actually Shot blocks and are tests for (non-)respawning Shot blocks. A bit to the left of the missile tiles are rows of Crumble blocks, likely used as testing grounds for dashing and Speed Booster, since it's possible to dash over Crumble blocks. The bottom middle has tests for Speed Booster, as there are columns of Bomb and Speed Booster blocks set up. In the bottom right are more Shot block tests. Along the bottom row are tests for the half-height tiles. In the upper right, there are tests for the oddly-shaped solid tiles that are prevalent in the bubble rooms of Norfair. Also in the upper right are tests for (non-)respawning Power Bomb blocks, Super Missile blocks and Crumbling Grapple points. Suspiciously absent are tests of the various sloped tiles. At one point, they may have been a part of the room, but could have been removed to make way for the tests currently in the room. Debug room with SMILE tiletype overlays. Debug room without SMILE tiletype overlays. 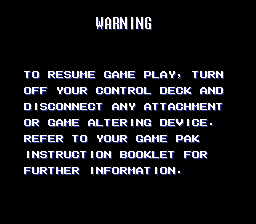 Using Game Genie code 8E67-C0DF or Pro Action Replay code 9009981D and starting or continuing a game will send the player to an unusual menu that displays the text "GAME QUIT WOULD YOU PLAY? END CONTINUE". 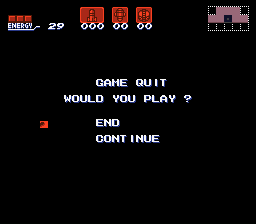 Selecting "End" will kick the player to the title screen, while selecting "Continue" will send the player back to where they were before the menu appeared, but with some glitched graphics. Of note is that the menu colors the item icons red and makes the HUD text use a different font never seen in regular gameplay. All collectable items can appear in three states: normal, hidden (requiring destroying an invisible block to reveal; used to hide items in walls, for instance), and encased in a glowing ball held by a Chozo statue. However, some items never have some of these states used. In the table below, Yes indicates that the state is used, and No indicates that the state is unused. Refer to the Notes page for more technical information. The Japanese and North American versions give you the option to select English or Japanese for the opening cutscene text. The European version replaced those options with German and French, though the rest of the game remains in English.